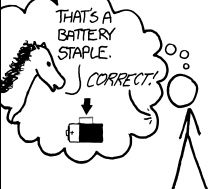 xkcd is awesome. You should read it. Minimum password lengths are a good idea. Expanding the character set is probably a good idea. But there’s actually a really easy way to improve usability and not tick off your customers. If I hit the “forgot password” link? Show me the password rules! I know my own thought processes; if I know what the rules are for choosing a password on your website, there’s a pretty good chance that I’ll immediately figure out what my password is rather than having to reset it with something that’s more difficult to remember. You’re not making things any easier for hackers, but you’re making it a lot easier for users.